Let your nails stand out with these sophisticated nail polishes from Paris Hilton Cosmetics. Catwalk-inspired trendly shades leaves you with the look of a professional manicure. 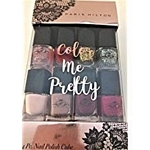 Many users love the Paris Hilton Nail Polish Line Collection because of simple design and diverse colors. Increased color gloss by professional mixture of ingredients, Shortened time of dry. You can apply your own trendy style of nail with diverse colors and glitter line. Moreover, reasonable price give more satisfaction to customers as practical item.